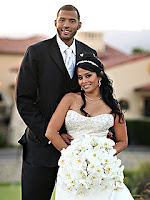 When Houston Rockets basketball player Brian Cook tied the knot earlier this month, his bride Victoria Velasquez (left) caused a sensation in a stunning gown from Priscilla of Boston’s Platinum Collection. But lots of non-famous brides-to-be are also discovering gowns from Priscilla of Boston thanks to the lush fabrics, beautiful beadwork and attention to detail. The newest Priscilla of Boston bridal gowns come with glam modern details like “crumb catchers” and empire waists, but also with vintage touches. Each gown is custom made and sizes go up to 24. The standard order time for gowns is around 16-18 weeks. See more gowns and read about real bride La’Keidra O. Hardeman on the Priscilla of Boston website. You go to My blog And see her.